The Aeolian Islands are a volcanic archipelago in the Tyrrhenian Sea in the vicinity of Sicily. They were named after the Greek demigod of the winds Aeolus. The locals residing on the islands are known as Aeolians. The magical setting of seven volcanic islands offers you numerous beaches, caves, inlets, cliffs and coves, incredible beauty and diversity of marine life, lush vegetation, volcanic lakes, cultural and historical richness, and the active volcano. You can embark on an epic journey of the purest sea, wild nature and cultural landmarks included on the UNESCO World Heritage list. These seven small but breathtakingly beautiful islands just off the north coast of Sicily are one of the best cruise destinations in Italy. 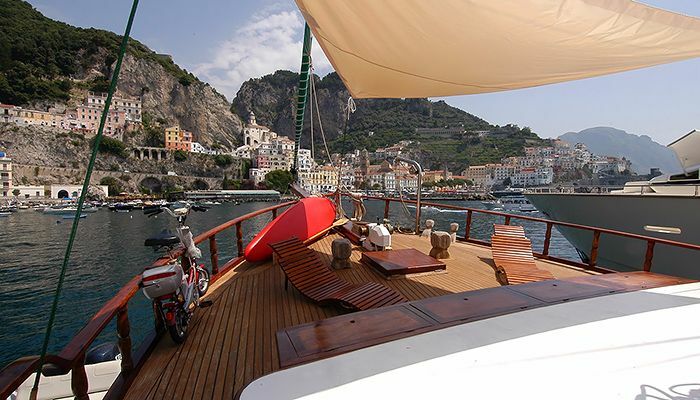 The cruise begins in the port of Milazzo on the north-eastern coast of Sicily. 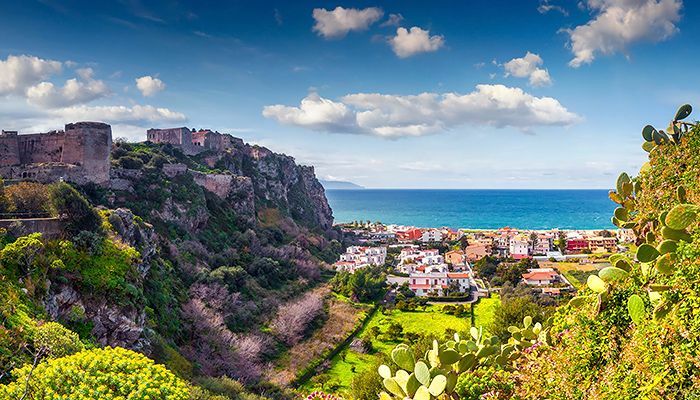 Milazzo is the third largest city in the province of Messina and one of the most important cities in Sicily. 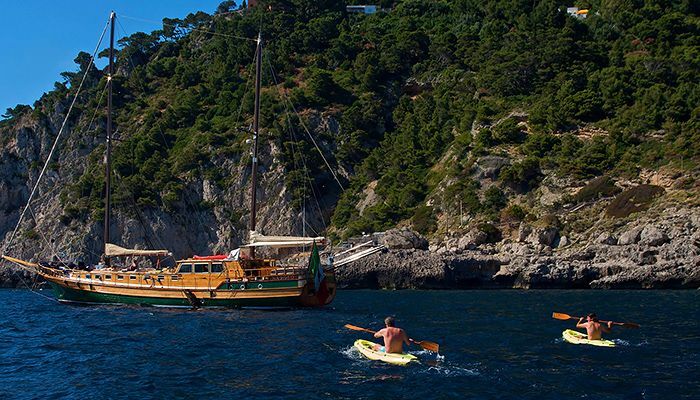 Before boarding the gulet you have a chance to explore the city’s landmarks, some of the many beautiful historical churches and the Castle of Milazzo that tells an interesting history of the Arabic in Norman occupation of the island. 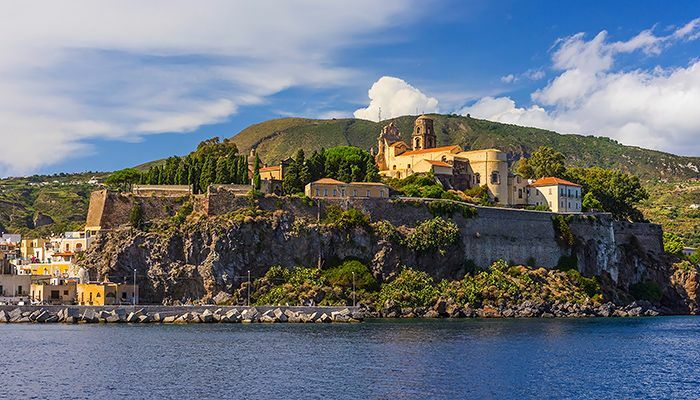 The first stop on the cruise is Vulcano (Hiera), the closest island to Sicily. Its name derives from the Roman god of fire. 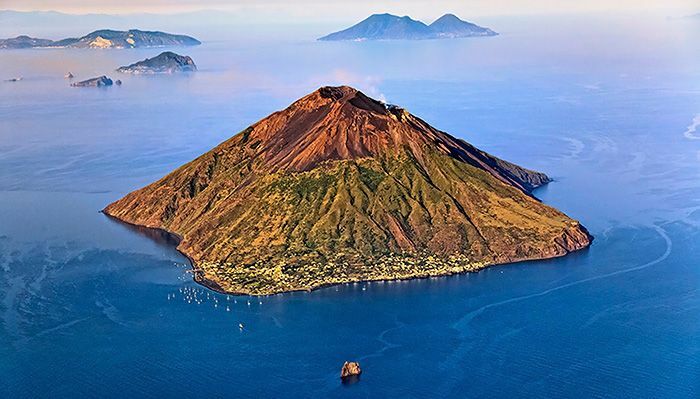 The island is composed of four volcanoes, Lentia, Piano, Vulcanello, and the most active Fossa. Vulcano is famous for the black sand beaches, mud pools and hot springs, which are believed to be therapeutic. Because of volcanoes, there is a characteristic odor of sulfur that is also used for inhalation therapy. The odor intensifies if you take the opportunity to go on an unforgettable hike to Gran Cratere. It is surrounded by geysers and emissions of sulfur vapors escaping from the Earth’s surface. The island offers many possibilities for entertainment with wonderful caves to explore, spa park, geothermal pools, shopping center and nightlife. 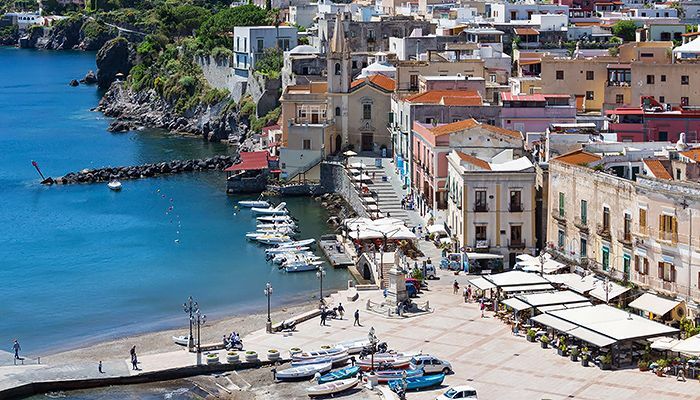 The cruise continues to Lipari, the largest island of the archipelago, inhabited since Antiquity and characterized by intense volcanic activity. The soil of the island is of volcanic tuff, obsidian, and pumice. Its coasts are characterized by cliffs and sea stacks with spectacular and breathtaking beaches. The white beaches are one of the most original coastlines in Lipari. The whiteness originates from the pumice sediments deposited in the sea over the centuries from the now abandoned quarries. You can wander through the quaint shopping streets and local produce markets or stop for a Sicilian pastry. Lipari is the proud home of an Archaeological Museum that contains the entire history of the archipelago, including an excellent collection of ancient Greek painted vases discovered in the waters nearby. The museum is extensive and offers a spectacular view of the city and sea. Next stop is the second largest and the greenest island in the Aeolian archipelago. It was named after the salt mines exploited in ancient times. There are two extinct volcanoes on the island which form the landscape that caused Greeks to named the island “Didyme” (“Twins”). This island is full of scenic hiking trails and is a protected nature reserve. 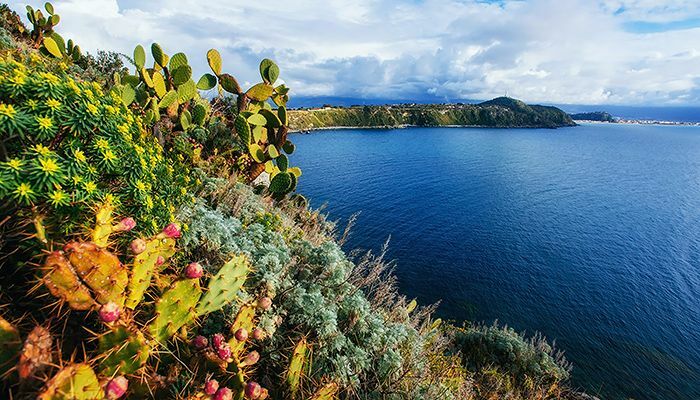 Besides its natural beauty, the island is renowned for the production of capers and “Malvasia”, two local products that are celebrated all year round. Malvasia is a distinctive wine with a very sweet flavor and aroma vaguely similar to raisins. 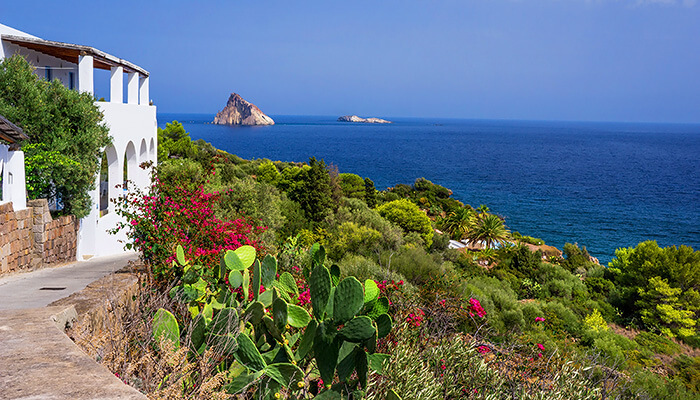 Panarea is the second smallest of the seven Aeolian islands and arguably the most beautiful. Together with its numerous isolotti (tiny satellite islets) Panarea forms a microcosmic archipelago that is quite worthy of a more intimate exploration. The island offers spectacular views from its stunning cliff tops and walking trails. En-route, you can visit the ruins of an ancient village “Villaggio Preistorico” which was used as a natural fortress by inhabitants over thousands of years. The surrounding waters of Panarea offer wonderful snorkeling and diving options and “Bollicine”, an underwater Sulphur spring, which is a rare phenomenon.You can also enjoy in picture-perfect white villages garlanded with bright bougainvillea, narrow lanes, plenty of fashionable boutiques, gourmet restaurants, and rooftop bars. 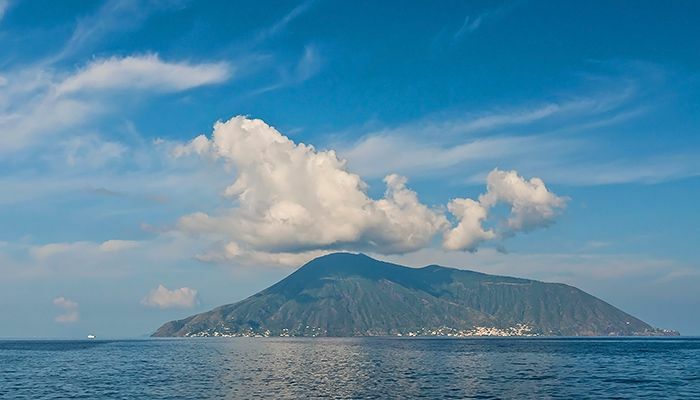 The last destination on the cruise is Stromboli, the latest island of the archipelago to have emerged from the sea. 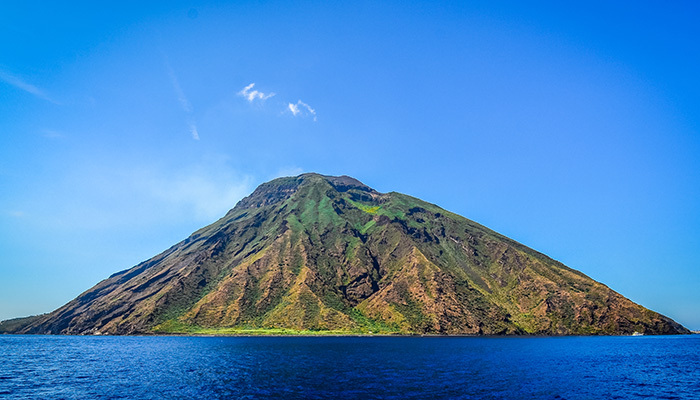 Stromboli is one of the most active volcanoes in Europe standing at more than 900 meters high. In ancient times, it was known as the “Lighthouse of the Mediterranean”. It is the only volcano in the world that has a regular and constant activity for over 200 years. 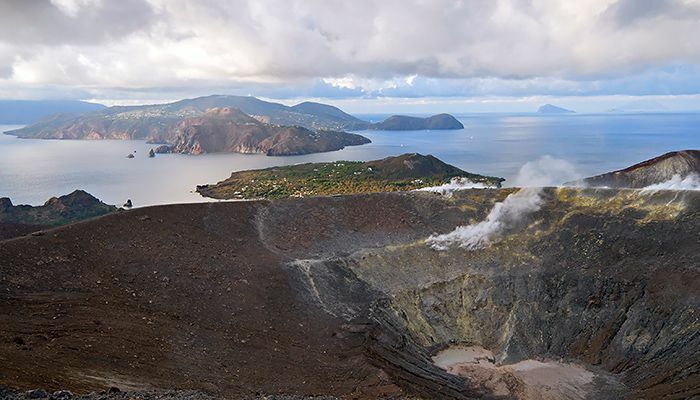 The volcanic phenomena of erupting lava, clouds of gas and impressive rubles can be observed from the close range by hiking on the slopes of the volcano. Viewing the frequent eruptions by day is spectacular enough, but at night, it becomes a totally different and unforgettable experience. Anchored not too far from the island is one of the best places to enjoy the flaming color of the lava while listening to the sound of the rocks rolling down into the sea. This volcanic mountain also extends miles below the sea and for those who enjoy scuba diving, it offers spectacular wall dives. Ginostra is certainly the most beautiful and best-known village on the island that lies at the foot of the volcano and can only be reached by boat.